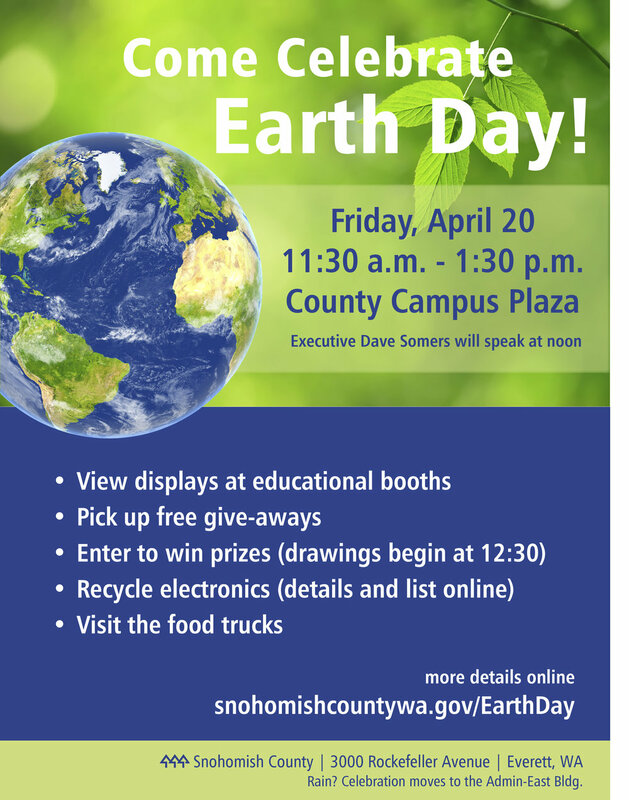 Please join us for an Earth Day celebration on Friday April 20th from 11:30-1:30 on the Snohomish County Campus plaza, with a special address from Snohomish County Executive Dave Somers at noon. There will be over a dozen informational booths with free giveaways, food trucks, electronics recycling (almost anything with a plug or battery), a drawing for various prizes at 12:30, a vactor truck display on water quality and road pollutants, and an all-electric Chevy bolt on display. You can sign-up for one of the volunteer events on Friday, Saturday, or Sunday that have been organized by Parks and partner organizations. Snohomish Conservation District will have a booth at this Earth Day Celebration.